I decided to post a paper on my blog that I wrote for my high school Freshman English class assignment in Southern California, along with the teacher’s personal comments. We were asked to write a paper during the class that described who we thought we were. Essentially, the paper was to be an autobiography. After some serious reflection, I wrote my one line response and relaxed for the duration of the class feeling that I was thoughtfully succinct and that there was no need to share more. The teacher, felt differently. The next day in class she handed back the paper with her comments in red. Over the years, I have shared the content of this paper as a Counselor, Hypnotherapist, and Life Coach in discussions about self-esteem, vulnerability, authenticity, judgment, compassion, and personal growth. We are enculturated with parenting, education, training, reading, social media, and life experiences. It is easy to become ‘other directed’ rather than inner guided. When we are other directed by peer pressure, fears, and judgments from others we lose touch with our authentic self. With inner guidance, we can embrace our spiritual essence. Below is a scanned copy of the front and back of the paper with her comments. 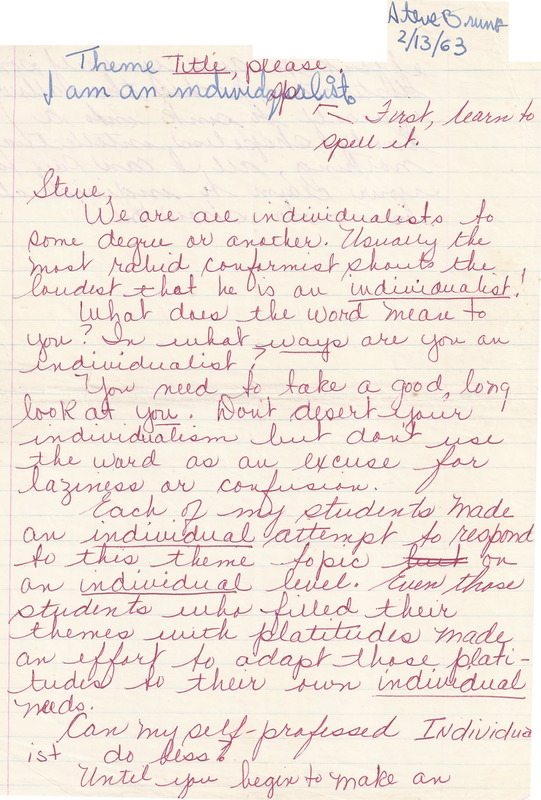 This entry was posted in Blog and tagged individualism, individualist, judgment.